The Yangtze River is the third largest river in the world, after the Amazon and the Nile. Its waters originate at “the top of the world” on the Tibetan Plateau, flow through 3,900 miles through China, and empty into the East China Sea. Fifty years ago, boats would be pulled upstream by thousands of coolies. Three Gorges: Woman and grand-daughter in Wuxia Gorge, one of the Three Gorges of the Yangtze River, Chongqing Province, 2007. Photo by John Hames. We sailed toward Sandouping Village to see the site of the controversial Three Gorges Dam project. Until huge new locks on the north bank are completed in a few years, ships will pass the dam site via a temporary channel, which has been dug out of the south bank. When complete, this massive hydroelectric project will displace 1.25 million people and submerge countless archaeological sites, 13 cities, 140 towns, and 1,352 villages, creating a reservoir equal in size to Singapore. 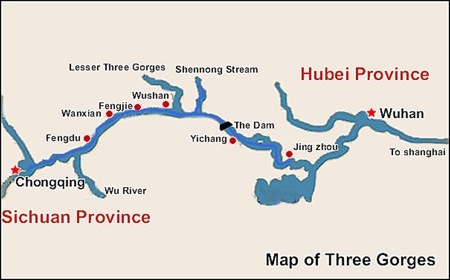 Energy: The dam will give 15% of China's electricity, mostly in the Yangtze River in area. Output will be equiv. To approx. 50% million tons of coal and produces 84 billion kilo. hrs. output per yr. Flood Control: will supposedly reduce the severity of flooding by 90%. Navigation: Allow the passage of 10,000-ton ships to Chongqing instead of only 5000-ton ships. Navigation benefits are exaggerated because heavy sediment buildup in the reservoir is likely to continue to hinder navigation. Flood control benefits are overstated: the reservoirs could at best store only a fraction of the floodwaters entering the Yangzte during a peak-flow year. Dam construction will divert funds from smaller, more beneficial, less risky projects. The reservoir will flood the best agricultural land in the region. Construction will force the resettlement of 1.4 million people. 108 site of cultural and historical importance will be lost. 80 species of fish, Yangzte dolphin, finless porpoise, Chinese sturgeon, and giant panda will be endangered. Possible disaster area... military target. 1919 Dr. Sun Yat-sent proposed the original flood control dam. 1954 Huge flood and all transportation stopped for 100 days. 1958 Chairman Mao proposed new plan. 1970 Compromise of the Gezhou Dam. 1980 Gezhou Dam completed. 1983 Yangzte Valley Planning Commission completes feasibility study of the Three Gorges Dam. 1985 U.S. working group formed and Canadian Int'l Devel. Agency finances feasibility study. 1989 CIDA determines project is technically, environmentally and economically feasible. 1990 Premier Li Peng revives the project. 1991 U.S. Bureau of Reclamation signs contract to give technical support. 1992 Chinese Congress voted on project 1700 votes total 1100 for it, 400 against, 200 abstained. 1993 Firmer U.S. and Canadian support withdrawn. 1997 Coffer dam completed, ships now diverted through channel. 1998 Visits of the site are now possible for the public. We departed from Sandouping that afternoon, going through the locks on the 3 Gorges Dam that raised our boat from 60 meters to 161 meters above sea level, and spent the remaining part of the day sailing the Yangtze. 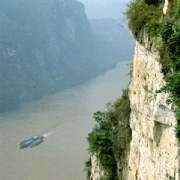 We entered Xiling Gorge, the longest of the gorges, noted for its narrow, precipitous cliffs. Xiling Gorge used to be terribly dangerous with rapids and narrow channels, but with the rapids blasted and the channels 100 meters higher than before, it is easy traveling. I loved the gray-on-gray mountain ranges to the WNW, where we were headed. We sailed past tombs, shrines, and caves; through stretches of tranquil water and through swirling rapids. We also saw high terraced farms where people had been relocated. Between 1.3 to 2 million people have been relocated because of the dam. Of those, 40% have moved downstream or to cities. 60% (mostly the elderly) have elected to stay in the region and just moved up higher. When mists allowed, we saw Twelve Peaks, Five Sisters Peaks, Three Brothers Rocks, The Needle, and Goddess Peak. The Xiling Gorge is one of the Three Gorges on the Yangtze River. It is 76 kilometers long, stretching from the Xiangxi stream to Nanjin Pass in Yichang. It is the longest and most difficult one of the three gorges to pass on the Yangtze River. Its channel is full of shoals, whirling pools and submerged reefs, making the water run in different directions. Tourist attractions include the Book on Art of War and Sword Gorge, the Cattle Liver and Horse Lung Gorge, the Lamp Shadow Gorge, the Black Shoal and the Discharge Water Shoal.